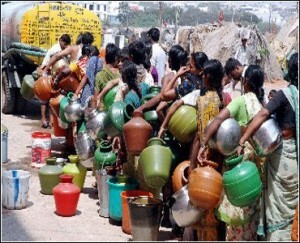 Inspirational image from the internet of women in India waiting in line for water. The concept for Mohona: Estuaries of Desire completes our four-year project begun with Kshoy!/Decay! in 2009. We began working on this project to explore violence experienced by women in global communities of color. We quickly realized that these complex issues needed to be investigated over a longer period of time that would allow us to generate and sustain artistic strategies for anti-violence work. We have come to understand systemic violence as an intersection of epic, historic violence such as colonialism and slavery; everyday violence resulting from hierarchies of race, class, gender, and sexuality; and violence enacted within and across communities in the name of tradition. Our quartet of dances since 2009 explores through four paradigms: mud/land(2010 Kshoy!/Decay! ), gold (2011, Tushaanal: Fires of Dry Grass), oil (2012, Moreechika: Season of Mirage), and water (2013, Mohona: Estuaries of Desire). Their stories show how these naturally occurring elements have been harnessed as capital, and have resulted in violence on women. Inspirational image found on the internet. Mohona: Estuaries of Desire is inspired by stories of women and water and the violence that has resulted from the widespread corporatization of this community resource. 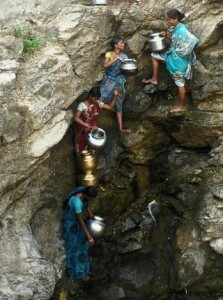 Working from stories of women’s struggles, pain, determination, and courage around access to water. Mohona becomes a way to remember, imagine, and celebrate their legacies. Water is material, quenching thirst and a metaphor, signifying flow, femininity, and resistance. Our creative and expressive performing space is imagined as an estuary located at the confluence of multiple marine flows, rich in possibilities, where dancers layer breath, movement, and voice. As we begin 2013 and deepen the work for Mohona, we invite you to share your stories of water with us on our blog as we take this journey together.